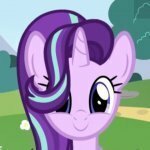 MLP G5 Reboot share your point of View. I can't wait for G5 I'm too curious as to what it'll be like. What comes to mind when you think of cats? Me and my family's 3 cats come to mind. I have a love/hate relationship with them. Are we forgetting that Starlight and Spike staged a somewhat elaborate act to try and snap her out of it? I think that's exactly why they did it. Especially since its still a kids show. Some random humor to keep the grimdark from getting too heavy handed. You can even see this in works of Shakespeare. Strategically-placed comedy scenes in what is otherwise a tragic drama, to give the audience a break from the gloom. This is why it's referred to as comic "relief."